Side pools are a common feature of tournaments and there are quite a few misconceptions around how they work. For the newcomer they are probably best left alone until you feel confident! What is a side pool? Essentially, a side pool on a tournament is a means for players to increase the amount of money they can win – with a corresponding increase in risk, of course. Each player in the tournament has the option to pay a fixed amount of money into the pool, and this money is won by the player(s) in the pool who progresses furthest in the tournament. Players who have not entered the pool are unaffected – they can win the main tournament prizes but have no interest in the pool. It is common for the pool money to be split 70% to the player who goes furthest, and 30% to the second place. This may vary – do check with the organisers beforehand if you are not sure. If players tie for “furthest”, the money is split between them. Organising a large tournament is a bit of a balancing act between two groups of players. On the one hand, you have strong players who want to play for significant sums of money, and players who may not be so strong but still enjoy, and can afford, the prospect of a big win on a good day. On the other hand, you have players who may be less confident about their ability, and players who are on a tight budget who would be turned away by high entry fees. Setting a relatively modest entry fee, but adding one or more side pools, allows both groups to play in the same tournament. Even those somewhere in the middle who might like an extra £10 “flutter” can have an enjoyable time without anyone having to play beyond their means. Here’s a simple little 8-player knockout tournament that’s just finished. Suppose Bob, Charlie, Derek, George and Harold have entered a £10 pool. That means there’s £50 available in the pool. George, who has reached the final, is the furthest player in the pool, as winner Alice hasn’t entered it. Semi-finalist Charlie is second-furthest. With a 70%/30% split, George collects (£50 x 0.7) = £35 from the pool, and Charlie £15. The rest lose out. Alice gets nothing from the pool, and might be kicking herself! What if there isn’t a clear winner? 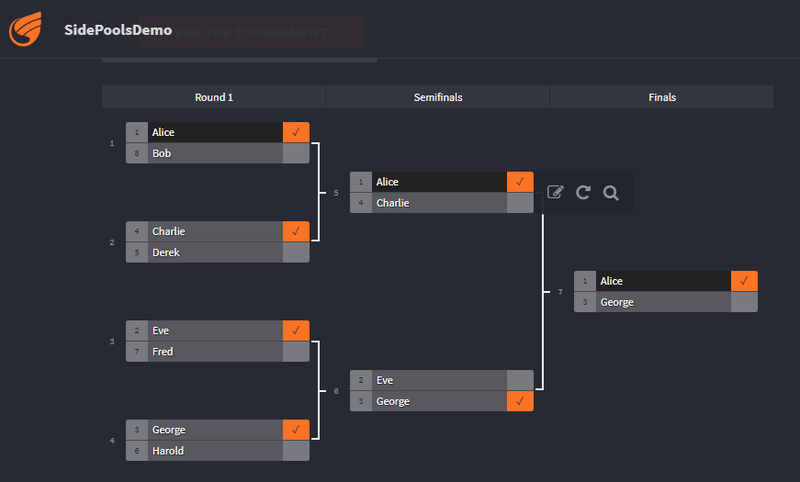 In the above tournament, now let’s suppose only Bob, Charlie, Eve and Harold enter the pool. Charlie and Eve are the two who make furthest progress, so they collect the £40 in the pool. But as they are tied, they take 50% (£20) each. Or, suppose it’s Bob, Charlie, Derek and Fred who enter the pool. Now Charlie is the clear winner of the pool and takes his 70%, or £28, but the second place is split equally between Bob, Derek and Fred who all fell in the first round – so they get a third of the £12 each. What if there are multiple side pools? If there’s more than one pool, they are usually for different amounts and, in the case of ‘discrete’ pools, are treated entirely independently. (Note that this does not apply to ‘variable optional pools’ – see the next section) There may be conditions on entry – for example, you might only be able to enter one, or specific combinations – in which case, the organiser will advise you. If there are consolation events going on, these may also have separate side pools. They would usually be smaller ones, and of course they are only open to players taking part in the relevant consolation. What is a Variable Optional Pool? A Variable Optional Pool is a single pool which a player can choose to enter for varying amounts, usually up to a specified maximum. A player who has entered for the maximum amount stands to win a share of the entire pool. However, a player who has entered the pool for less than the maximum can only win a share of the total corresponding to the sum of all pool entries up to that level. This player cannot win the “top slice” of the pool, that is, the portion of all pool entries above that player’s entry level. Variable optional pools allow strong players (or those with deep pockets) to sweep up the lion’s share of the pool money by entering the pool at the maximum level. It is best not to enter this type of pool unless you fully understand it. How can I follow the state of a pool? Normally on tournament draw sheets, the director will mark up which of the surviving players are in each pool during the later stages, so you can see the possible outcomes. Never put more money at risk than you can comfortably afford to lose. Even the strongest player can have a stinker of a tournament and lose every single match. Side pools are a way of ensuring everyone has the opportunity to take part without breaking the golden rule above.